The tool has many features including the one shown above--Searching for data from the web based on a query. You user can choose one of the results and a new Excel Sheet is created with data from the selection chosen. This is a handy tool for consumers who want to search and use data easily. Once the data is copied to Excel any of the other features of Excel can be applied to the data copied. I do not know the criteria used to display the search results. It has many other features that are also useful. One feature that needs to be highlighted here is data integration capabilities of the add-in. Any business user knows that attempts to use multiple data sources simultaneously often needs a "ticket" for the geek squad and then time spent waiting for ticket to be handled based on process, urgency etc. 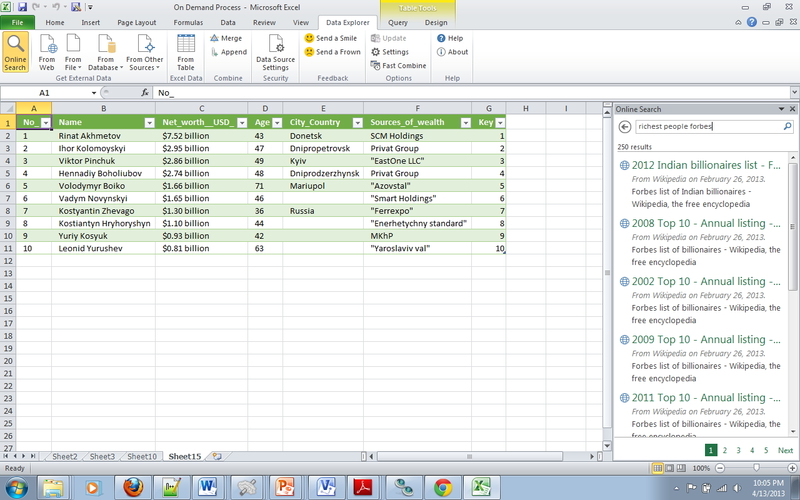 This tool allows for a business user to self integrate multiple data sources. It is not as easy as one might think but is workable. 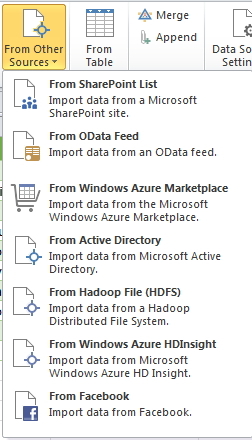 I recommend the add-in for any power Excel user. Note: The tool was released on April 11, 2013.